David Mercier speaks about transitional management- "Le Nouvel Economist"
Le Nouvel Economiste mentions David Mercier , CEO of STRAMMER, in its press release about Transitional Management. High-leveled profiles quickly available for specific and varied needs: Transition management appeals more and more to companies. The transition management market, while being confidential, is slowly growing. This term refers to the use of high-levelled external operational skills, in a short and limited amount of time. It’s about helping businesses to makes a difference- crisis, restructuring – or helping them grow, with the help of experiences executives. To this day, the demand for transitional management mainly comes from the industry sector, but the business is just waiting to expand in all sector and functions. The transitional management market amounts to about 300 million euros in 2016, according to a Xerfi study carried out on behalf of the FNMT (National federation of Transitional Management). The process “transitional management” is known as (“interim management abroad”) the use of high-level external operational skills, for specific missions carried out in a short period of time: 150 days on average. Companies specialising in this field, recruitment or consulting firms reporting this kind of activity, or also freelance managers who perform a total of 2,000 missions per year and paid on average 1,000 euros per day. This sector experienced a growth of +17% in 2016, which led the FNMT to organise the first Foundations of Transitional Management in October 2017. “Customers are asking us urgently, often as a result of managerial break”, explains Jean-Pierre Lacroix, president of the FNMT and general manager of MCG Managers, a firm based in Lyon. However, professionals in this sector want to evolve and become the key player in business transformation. The market still faces some difficulties. “This is a fairly confidential market because it is focused on top management”, acknowledges Jean-Pierre Lacroix. The occupation wishes to evangelise to make the benefits more well known of using transitional management. The job was born in the 1970’s in the Netherlands with the first missions to manage periods of crisis or change. The firm MCG was founded in 1990 by an expert from the board and a former receiver. “They realised that there was a market to help companies before recovery or legal liquidation.”, analyses Jean-Pierre Lacroix. This is the new field of action for a transitional manager. To concretely manage an absorption, integrate a new asset into the group, separate the activities of a company to sell part of it, build a factory, transfer production from one country to another, set up a new ERP, improve performance… “We carry out our missions in practice, not in consulting says Jean-Pierre Lacroix. We have the key parts of the company. “And customers understand that transitional managers can positively help to make a course, to co-build partner, outside crises and breaks. Transitional managers take on leadership roles and lead teams. Therefore, they are qualified experts and experiences professionals, with strong references, a strong base of skills, several years in a high management situation. “They have experimented with strategic decision-making, managed teams, and budgets”, says Jean-Pierre Lacroix. On a personal level, they have taken risks, changed their company and function, they are pragmatic and operational. “In summary, transitional managers combine their skills, expertise, and what they convey. The activity is based on the ability to mobilise a network of excellence. “We created Club Delville, which is the structuring of our network, announces Patrick Abadie. It brings together transitional managers and coaches interested in this profession. We rely on this pool and we call on co-option. Since 2010, this has allowed us to be 80% responsive to customer requests, presenting a shortlist of candidates within 72 hours. “At Robert Walters, senior managers and consultants form a pool of 3,500 candidates. In our pool of managers we must distinguish between transition managers and managers in transition,” says Jean-Pierre Lacroix. The transition manager is a person who no longer wants to be in a career management scheme and who decides to give more meaning to his activity, choosing his missions and focusing on its added value, even if this implies more risk and hazard. This is the case of a number of executives today.” Similar to the new expectations of a part of the active population, these managers no longer want to depend on a boss, they want more flexibility and variety in the missions, and flourish in new sectors and new trades. “Managers in transition find themselves on the market at some point in their careers,” explains Jean-Pierre Lacroix. Before finding a permanent job, they decide to do a mission or two, to discover a new universe. “In recent years, the profession has been rejuvenated with the arrival of forty-year-olds curious to discover this profession of top of the line “free-lance”. In addition, the limited time of the mission allows access to oversized profiles compared to what a recruitment would have allowed. “It’s important because you need someone who understands the business very quickly, someone who can immediately be operational,” says Karina Sebti. 60% of transition management clients are in the industrial sector, according to the FNMT. “The industry is a very mature sector, with a search for productivity gains”, says Patrick Abadie. “We also intervene when industrial structures have problems affecting their subsidiaries, with a key position vacant abroad, where recruitment can be very long,” adds Karina Sebti. The main businesses concerned are the general management, the financial affairs department and the human resources department: 55% of the missions, according to the quarterly barometer of the FNMT. “The demand in the functions related to the operations is increasing, points Karina Sebti. Site managers, purchasing functions and quality managers are requested.” The operation’s division deals with a third of the requests at Delville Management. In other directions such as marketing and sales, demand remains marginal. “How was it done before? asks Patrick Abadie. In the event of a ‘hole in the organisation chart’, for example, the managers contacted a former partner or set up an n-1.” Today, some sectors still do not have the reflex “transitional management”, just like the bank, not very demanding. Other professionals play a role similar to that of transitional managers, such as coaches. 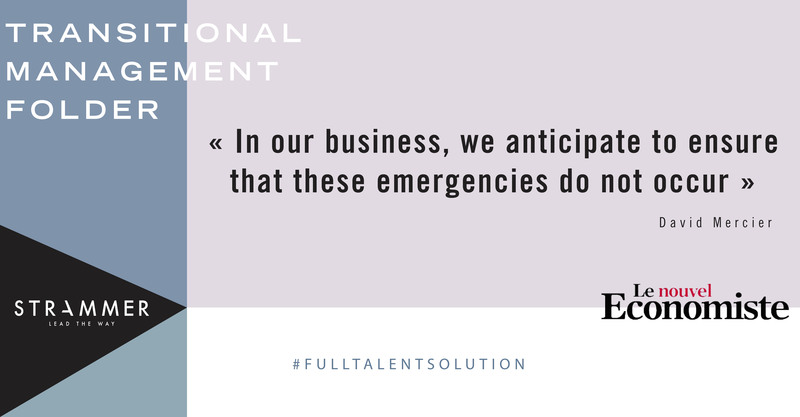 “In our business, we anticipate to ensure that these emergency situations do not occur,” says David Mercier, CEO of STRAMMER, a management consulting firm specialising in the Life Sciences industry. We propose for this purpose ‘talent strategy‘. We develop talents so that in the short, medium and long term, they can take n + 1 and n + 2 positions. “The transitional manager remains a real tool of flexibility, an exceptional remedy, a better purpose throughout daily life. Article written by Solange Brousse.